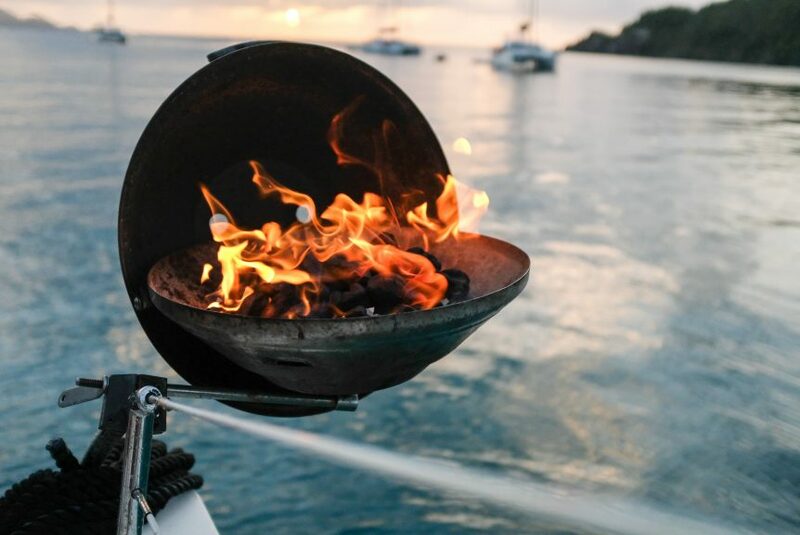 There’s nothing better than enjoying a boat grilled meal whilst on the water. Imagine enjoying a day out on the water with your favorite people, whether it be friends, family, or both! The market is full of some amazing boat grills, designed for pontoon boats. You have the power to choose from any of these fantastic grills. Though, with great power, comes great responsibility. Not all the grills are as great as each other. In fact, some grills are complete trash and a waste of time and money. Grill manufacturers have been criticized for re-marketing cheap grills for boating use, despite them not being designed for marine use whatsoever. They fail to understand that when on a boat, the grill will be subject to a harsher environment. For example, a grill which isn’t designed for marine use will rust quickly due to water, and the flame may not last due to high winds. You’ll have to make the ultimate decision as to which grill you want to purchase. To make this decision a bit easier for you, I’ve compiled 5 reviews of the best Pontoon Boat Grills on the market. I’ve done extensive research and found worthy candidates for such a list. Any of the five grills that I’ve reviewed will provide you with an amazing on the water BBQ experience, though I have a top choice which I’d highly recommend you at least look at. I’d highly recommend the Cuisinart Grill. This grill is specifically modified for pontoon boats and comes with Arnall’s grill bracket set. This is probably the best grill and bracket set on the market for pontoon use. This would be my first choice for a grill on my boat. This is also a very inexpensive option. This is amazing bang for your buck, with this grill – you’ll be getting your moneys worth. The main attraction to this grill is the fact that it’s rust-resistant. This means that if any water gets into the grill, it’s extremely unlikely to damage the grill. The Arnall’s bracket set is also very strong and durable. It will survive the harshest weather and keep your grill safe. You won’t need any tools to securely install this set. This grill also comes in three different colours, black, red, and blue. This is another good grill for pontoon boats. It has amazing functionality, being a combination of a stove and a grass grill. You can cook your food however you like it on this grill. This is a good-looking grill, with a polished stainless-steel build, designed for long lasting beauty and enhanced corrosion resistance. This grill features a heavy-duty inner safety shell which fortresses the outside of the grill and keeps it cool. This guards defends against discoloration and prolongs the life-span of the grill. This grill is perfect for boat-use due to it’s waterproof electronic ignition system. It lights first time, every time. The main down-side of this grill is its size, it’s not the biggest and you may have to cram your food in, if you intend on cooking a large meal for multiple people – however it works just fine if you’re only cooking for a small group. The Springfield Deluxe Propane Grill is an amazing grill, perfect for most types of boats. This would make for a great addition to your boat. This is a slightly different type of grill, instead of being mounted using a bracket, this grill uses a pedestal seat mount. The down-side to this is that it takes up room on the boat and can get in the way. This grill could also be used on land, which is perfect if you want to use this grill on your boat and on land. All you must do is remove the post which it comes with. This prevents you from having to purchase two different BBQ grills. The Kuuma Stow and Go 160 is a decent grill, I wouldn’t say it’s the best however it’s much better than a lot of other options on the market. This grill can be mounted to any pedestal mount, rod, or Kuuma Rail. This grill features a removeable grease tray which makes cleaning easier and more convenient. This grill requires no assembly, making it easy to use straight out of it’s packaging. Due to it’s compact size, it’s very portable and can be stored without taking up much room. The Newport 2 is a great addition for any boat. This grill uses infrared technology which evenly distributes heat and reduces flare-ups. This grill features a tempered glass viewing window which allows you to view your food whilst it’s being grilled without exposing the food to the elements. This allows you to cook in harsh conditions. With fold-away table top legs, this grill is very portable and can be used anywhere. 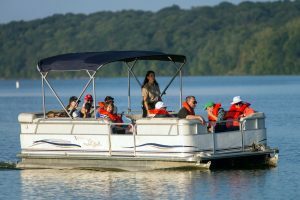 There are a few factors which you should take into consideration when deciding what is the best pontoon boat grill. You’ll have to weigh these factors against each other and decide which are more important to you. For example, if you have a small boat then the size of your grill will matter more than it would for someone with a big boat. The portability of your grill is an important factor as you’ll have to transport your grill more than you would for a normal backyard grill. Also, you’ll need to ensure that your grill doesn’t unbalance your boat. This means you should try your best to get a lightweight grill and avoid bulky ones. The main attribute which contributes to the portability of a grill is its weight. Obviously, a heavier grill will have lower portability as it’s harder to manipulate. Often grills may come will handles or grips which can increase the portability of a grill. You should know how big your boat is and how many people to intend to cook for. Using this information, you’ll need to decide which grill you’re going to purchase. For example, if you boat is small then you should get a small grill so that it doesn’t take up the needed space. If you have a large family or many friends which you need to cook for, you should purchase a grill large enough to accommodate for the food that you’ll need. Warranty is something which you keep an eye out for when purchasing a pontoon boat grill. This is because these grills are not cheap pieces of equipment, if yours ends up malfunctioning, they’ll be expensive to replace. Therefore, I recommend you purchase a grill from a brand which offers warranty. If a grill doesn’t come with warranty, then it’s likely that the brand does not have confidence in their product. The longer the warranty lasts, the better.